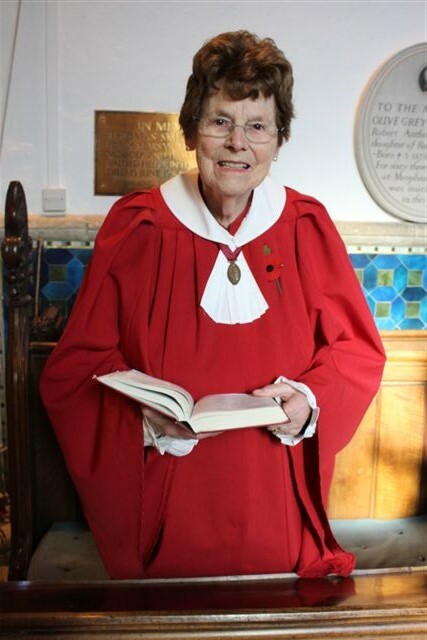 Enid Lander recently celebrated her 90th Birthday, and 58 of those years she has sung alto in her Parish Church Choir. She first sang soprano at St. Mary’s Gravesend and since moving into Meopham she has been a committed choir member, rarely missing choir practice. Over the years she has known six Vicars/Rectors and numerous choir masters! She loved the four part harmony of Mattins and Evensong, especially the Psalms and the Anthems sung in Parish Communion. In her working life she was a popular junior teacher who believed in the ‘4 R’s’ including R.I. In her spare time she was, for over 30 years, ‘AKELA’ in her local Cub Pack. She has inspired countless young people and has indeed ‘shone as a light in the world to the Glory of God the Father.’ Throughout these years, Enid has valued the friendship of choir members and the spiritual strength given through the music in times of sorrow, and because of her enthusiasm for living, in the countless joys too.